GC Sanx Hey! Say! Jump! I am very happy for you, Mitsuyo! Good work! I am very pleased that I sent Swan Song to you. She truly was a "Swan Song". CH Sanx Hey! Say! Jump! 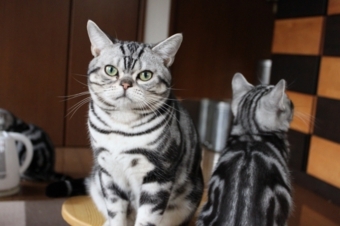 KENJI TAKANO BEST SHORTHAIR 2BEST ALL BREED 6 best catChampion !!!. One Show Grand Champion !!!. In total he received 210.4 points at this show. Ayumi Ueda (AB) Best kitten!! Yoshiko Sada (AB) Best kitten! Megumi Yamashita (AB)2nd best kitten! Yoshiko Sada (AB) Best cat! Longhair kitten35, shorthair kitten 25, Total kittens are 60. Longhair champion 24, Shorthair champion 32. Sanx Akari , Silver tabby female, Just 5month old!! Cattery Sanx ☆アメショー☆ since 2010-06-03 / Copyright 2009 Cattery Sanx. All Rights Reserved.